GRAPEVINE, Texas — Goodyear Tire and Rubber Co. said during a customer event here that internal data has found that 15% of truck tires its customers inspected are either underinflated or have other issues that could impact the tires' performance. 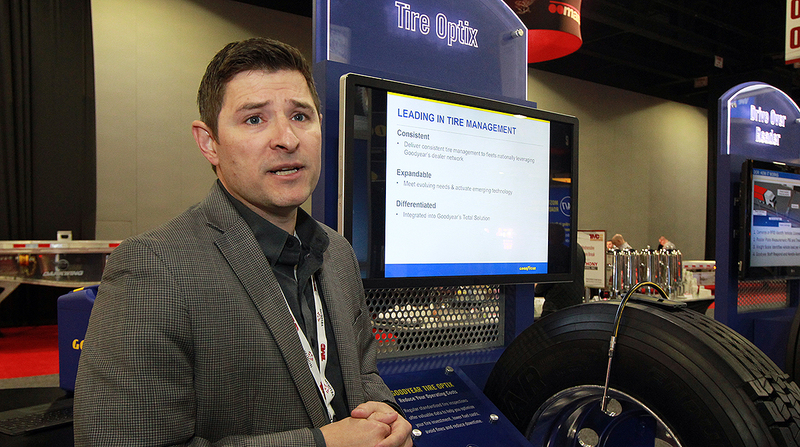 Engineers speaking last month at the compay’s annual Goodyear Customer Conference said the findings were culled from the manufacturer’s Tire Optix commercial truck management program, which customers have used to inspect nearly 1 million tires within the last year. The cloud-based app can digitally measure tread depth, monitor air pressure, inspect a tire’s overall condition and keep track of a tire’s performance. “The whole goal of that is to maximize the value they are getting out of the tire assets and maximize the uptime of their equipment,” said Johnny McIntosh, the company’s general manager for commercial tire services and solutions, in an interview with Transport Topics. The measuring device is about 12 inches long. At one end is a probe that measures tread depth. It also features a conventional pressure gauge for checking air pressure. Using a smartphone that contains an app, the technician can strap the phone to one arm and use the other hand to check the tire's condition. Maintaining proper air pressure distributes the weight of a truck evenly across the tire’s footprint. Under- or overinflated tires can lead to uneven tire wear and affect stability, as a difference of as little as five PSI between a truck’s steer tires can cause the front to pull to one side, the company said. Using bluetooth technology the device connects wirelessly to the cloud while the app provides instant feedback on a tire’s tread condition and tire pressure. Historical data from inspection to inspection is stored so users can track a tire’s performance compared with its condition in earlier inspections. There is also a drop-down menu where users can make notations about factors such as irregular wear or sidewall damage. Users can also snap photos on their phones and upload the images through the app. McIntosh said the digital system is a substantial upgrade over tracking tire condition with paper logs or spreadsheets. The system can record and upload information on a truck’s tires in less than five minutes, Goodyear said. McIntosh said he can see the program being expanded to rental car companies and other transportation-related businesses where tire performance is critical.